On the 4th of July, 1.689, being already M.A. in the university of Cambridge, he was incorporated as such in the university of Oxford, in Wadham college, and is mentioned by Anthony Wood (though then but a young man, a good deal under thirty) as a genius that was promising, and to whom the world was likely to be obliged, for his future studies and productions. In 1691 he published a Latin epistle to John Mill, D.D. 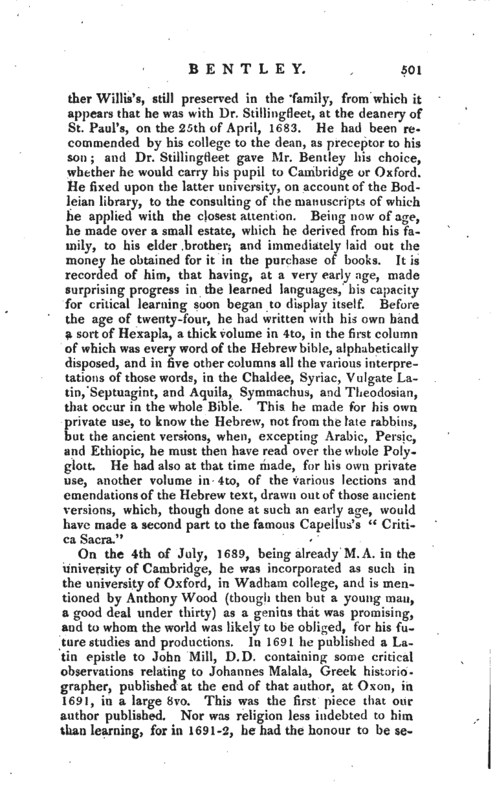 containing some critical observations relating to Johannes Malala, Greek historiographer, published at the end of that author, at Oxon, in 1691, in a large 8vo. This was the first piece that our author published. Nor was religion less indebted to him than learning, for in 1691-2, he had the honour to be | selected as the first person to preach at Boyle’s lectures (founded by that honourable gentleman, to assert and vindicate the great fundamentals of natural and revealed religion), upon which occasion he successfully applied sir Isaac Newton’s “Principia Mathematica,” to demonstrate the being of God, and altogether silenced the Atheists, who, in this country, have since that time, for the most part, sheltered themselves under Deism. The subject of his discourses was the folly of atheism, even with respect to the present life, and that matter and motion cannot think; or a confutation of atheism from the faculties of the soul, from the structure and origin of human bodies, and the origin and trame of the world itself; and though he was bnt young, and even only in deacon’s orders, he laid the basis and foundation upon which all the successors to that worthy office have since built. 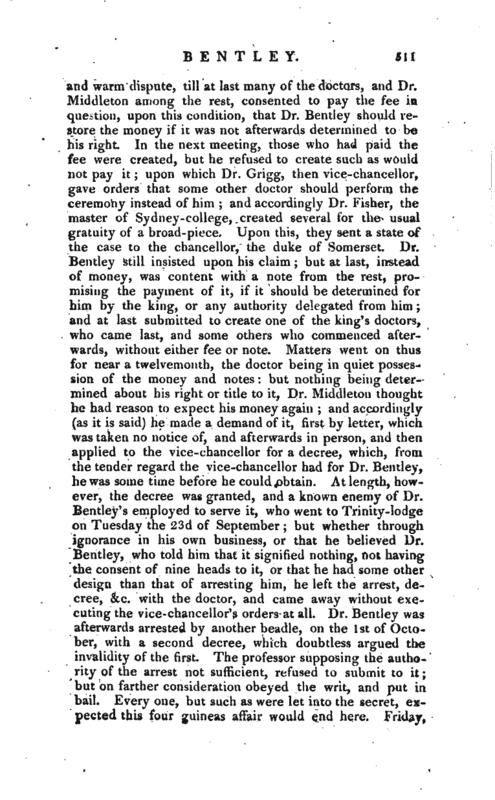 Though this was a task of great extent, and no small difficulty, yet Mr. Bentley acquitted himself with so much reputation, that the trustees not only publicly thanked him for them, but did moreover, by especial command and desire, prevail upon him to make the said discourses public, upon which he gave the world a volume, 1693, 4to, containing eight sermons, which have not only undergone a number of editions, but have been translated abroad into several languages. On the 2d of October, 1692, he was installed a prebendary of Worcester by bishop Stillingfleet. Upon the death of Mr. Justel, Mr. Bentley was immediately thought upon to succeed him, as keeper of the royal library at St. James’s; and accordingly, a few months after his decease, he had a warrant made out for that place, from the secretary’s office, December 23, 1693, and had his patent for the same in April following. 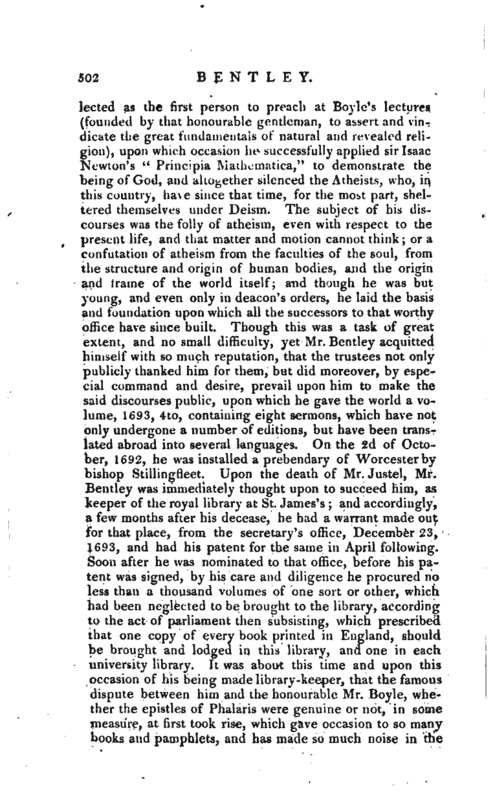 Soon after he was nominated to that office, before his patent was signed, by his care and diligence he procured no less than a thousand volumes of one sort or other, which had been neglected to be brought to the library, according to the act of parliament then subsisting, which prescribed that one copy of every book printed in England, should be brought and lodged in this library, and one in each university library. It was about this time and upon this occasion of his being made library-keeper, that the famous dispute between him and the honourable Mr. Boyle, whether the epistles of Phalaris were genuine or riot, in some measure, at first took rise, which gave occasion to so maiw books and pamphlets, and has made so much noise in the | world. This controversy upon a point of learning, in itself not very entertaining, was managed with a wit and humour which rendered it interesting to the public. The world was at that time a little biassed in favour of the production of the young nobleman, at least as to the genteel raillery of his pieces; for as to the dispute itself, viz. 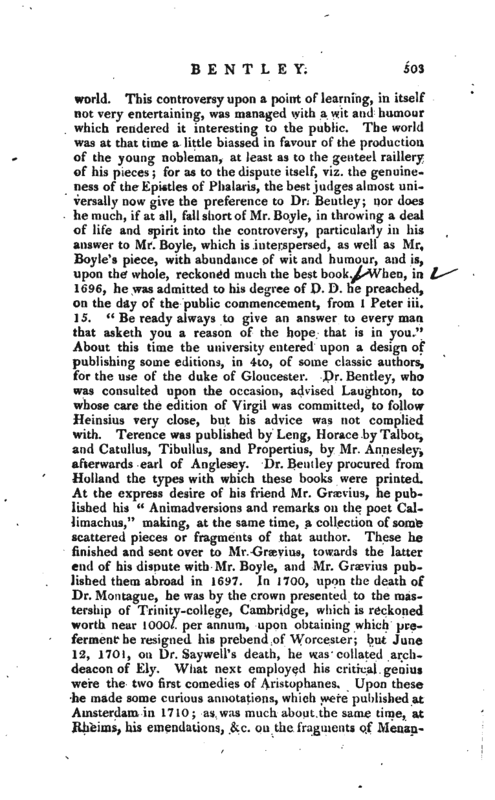 the genuineness of the Epistles of Phalaris, the best judge^s almost universally now give the preference to Dr. Bentley; nor does he much, if at all, fall short of Mr. Boyle, in throwing a deal of life and spirit into the controversy, particularly in his answer to Mr. Boyle, which is interspersed, as well as Mr. Boyle’s piece, with abundance of wit and humour, and is, upon the whole, reckoned much the best book. When, in 1696, he was admitted to his degree of D. D. he preached, on the day of the public commencement, from 1 Peter iii. 15. “Be ready always to give an answer to every man that asketh you a reason of the hope that is in you.” About this time the university entered upon a design of publishing some editions, in 4to, of some classic authors, for the use of the duke of Gloucester. 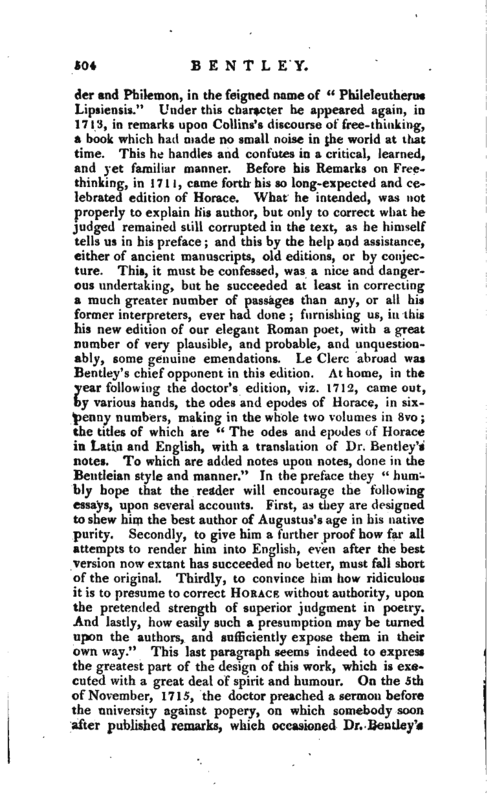 Dr. Bentley, who was consulted upon the occasion, advised Laughton, to whose care the edition of Virgil was committed, to follow Heinsius very close, but his advice was not complied with. Terence was published by Leng, Horace byTalbot, and Catullus, Tibnllus, and Propertius, by Mr. Annesley, afterwards earl of Anglesey. Dr. Bentley procurecUfrom Holland the types with which these books were printed. At the express desire of his friend Mr. Graevius, he published his “Animadversions and remarks on the poet Callimachus,” making, at the same time, a collection of some scattered pieces or fragments of that author. These he finished and sent over to Mr. Grarmus, towards the latter end of his dispute with Mr. Boyle, and Mr. Graevius published them abroad in 1697. in 1700, upon the death of Dr. Montague, he was by the crown presented to the mastership of Trinity-college, Cambridge, which is reckoned worth near 1000l. per annum, upon obtaining which preferment he resigned his prebend of Worcester; but June 12, 1701, on Dr. Say well’s death, he was collated archdeacon of Ely. What next employed his critical genius were the two first comedies of Aristophanes. Upon these he made some curious annotations, which were published at Amsterdam in 1710; as was much about the same time, at Rheims, his emendations, &c. on the fragments of | Menancler and Philemon, in the feigned name of “Philcleutherus Lipsiensis.” Under this character he appeared again, in 1713, in remarks upon Collins’s discourse of free-thinking, a book which had made no small noise in the world at that time. This he handles and confutes in a critical, learned, and yet familiar manner. Before his Remarks on Freethinking, in 1711, came forth his so long-expected and celebrated edition of Horace. What he intended, was not properly to explain his author, but only to correct what he judged remained still corrupted in the text, as he himself tells us in his preface; and this by the help and assistance, either of ancient manuscripts, old editions, or by conjecture. This, it must be confessed, was a nice and dangerous undertaking, but he succeeded at least in correcting a much greater number of passages than any, or all his former interpreters, ever had done; furnishing us, in this his new edition of our elegant Roman poet, with a great number of very plausible, and probable, and unquestionably, some genuine emendations. Le Clerc abroad was Bentley’s chief opponent in this edition. At home, in the year following the doctor’s edition, viz. 1712, came out, by various hands, the odes and epodes of Horace, in sixpenny numbers, making in the whole two volumes in 8vo; the titles of which are “The odes and epodes of Horace in Latin and English, with a translation of Dr. Bentley’s notes. To which are added notes upon notes, done in the Bentleian style and manner.” In the preface they “humbly hope that the reader will encourage the following essays, upon several accounts. First, as they are designed to shew him the best author of Augustus’s age in his native purity. Secondly, to give him a further proof how far all attempts to render him into English, even after the best version now extant has succeeded no better, must fall short of the original. Thirdly, to convince him how ridiculous it is to presume to correct Horace without authority, upon the pretended strength of superior judgment in poetry. 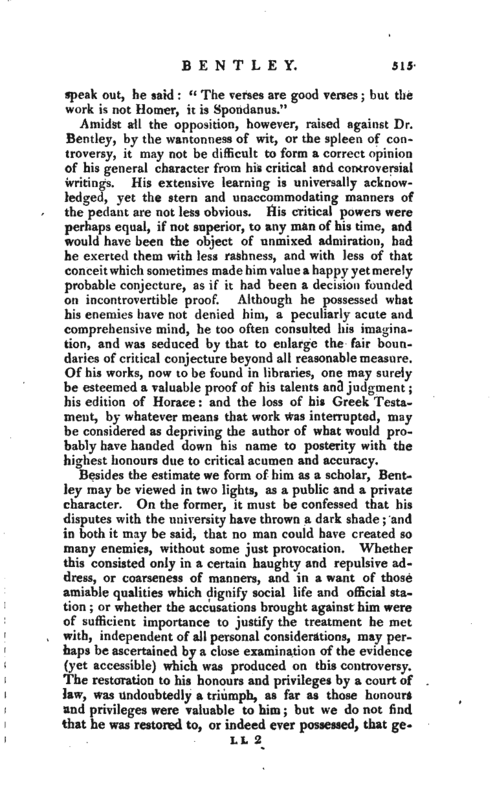 And lastly, how easily such a presumption may be turned upon the authors, and sufficiently expose them in their own way.” This last paragraph seems indeed to express the greatest part of the design of this work, which is executed with a great deal of spirit and humour. On the 5th of November, 1715, the doctor preached a sermon before the university against popery, on which somebody soon after published remarks, which occasioned Dr, Bentley’s | answer, entitled “Reflections on the scandalous aspersions cast on the Clergy, by the author of the Remarks on Dr. Bentley’s Sermon on Popery, &c.” This was printed in 1717, in 8vo. In 1716, at which time he succeeded to the chair of Regius professor of divinity, the doctor had two printed letters inscribed to him, dated Jan. 1, to which also was added his answer, concerning his intended edition of the Greek Testament, giving some account of what was to be expected in that edition; and in them we are informed, that he intended to make no use of any manuscript in this edition that was not a thousand years old or above; of which sort he had got at that time twenty together in his study, which made up, one with another, 20,000 years. After having had this affair in agitation for about four years, he at last published proposals for it, which met with great encouragement. 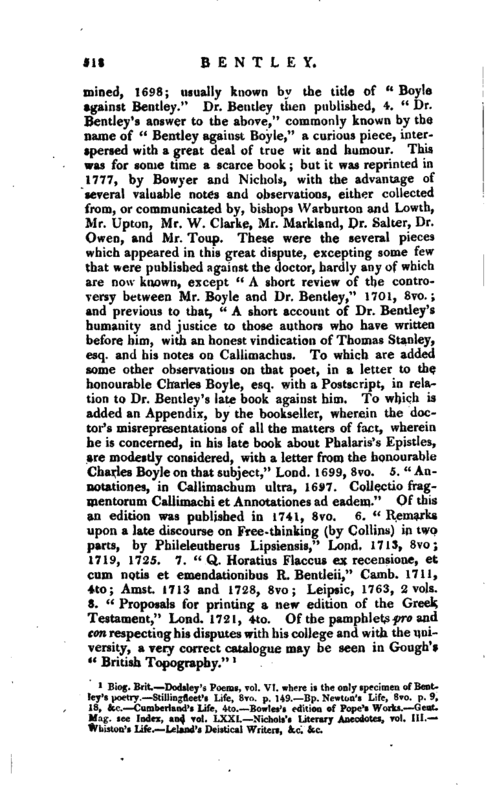 But soon after came out Remarks, paragraph by paragraph, on these proposals, by Dr. Conyers Middleton, as it afterwards appeared, who sets out by assuring his reader, that it was neither personal spleen, nor envy to the author of the Proposals, that drew the following remarks from him, but a serious conviction that Dr. Bentley had neither talents nor materials proper for the work, and that religion was much more likely to receive detriment than service from it. “The time, manner, and other circumstances of these proposals,” says he, “make it but too evident, that they were hastened out to serve quite different ends than those of common Christianity; and I think it my duty to obviate, as far as I am able, the influence they might have on some, whom big words, and bold attempts, are apt to lead implicitly into an high opinion and admiration of the merit and abilities of the undertaker.” Dr. Middleton then proceeds to criticise, paragraph by paragraph, Dr. Bentley’s proposals. 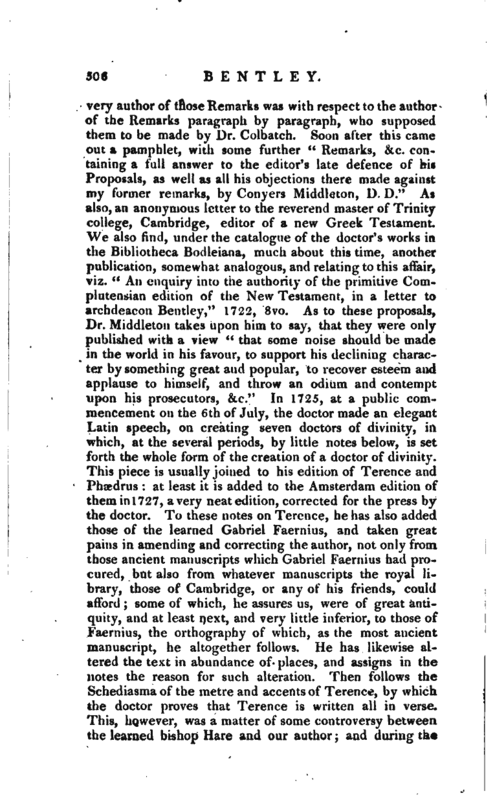 Soon after these Remarks, paragraph by paragraph, the Proposals appeared, with a pamphlet entitled “A full answer to all the Remarks of a late pamphleteer, by a member of Trinity college, Cambridge,” 1721, signed J. E. This Dr. Middleton, and all, imagined could be none but the doctor himself, as well from the style, as the letters J. E. the two first vowels of Richard Bentley: and, upon this supposition, Dr. Middleton and others, in their future remarks, make that one great handle for abusing him. It is, however, somewhat uncertain, whether Dr. Middleton might not be as much mistaken as to the author of those Remarks, as the | very author of those Remarks was with respect to the author of the Remarks paragraph by paragraph, who supposed them to be made by Dr. Colbatch. 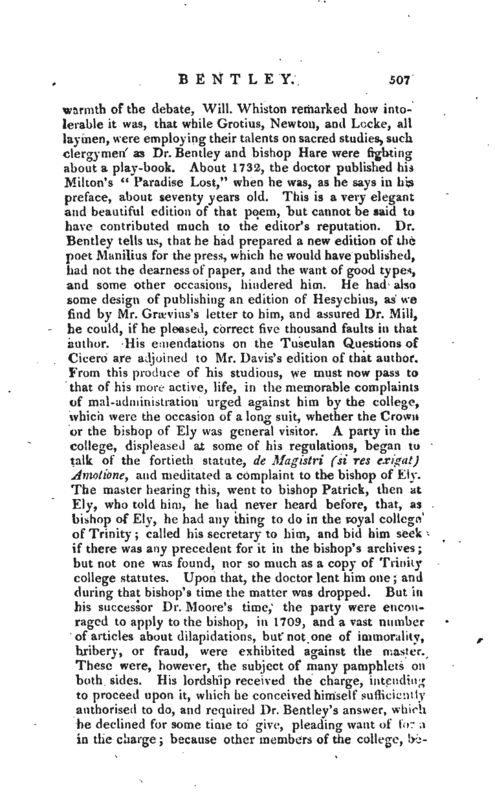 Soon after this came out a pamphlet, with some further “Remarks, &c. containing a full answer to the editor’s late defence -of his Proposals, as well as all his objections there made against my former remarks, by Conyers Middleton, D. D.” As also, an anonymous letter to the reverend master of Trinity college, Cambridge, editor of a new Greek Testament. We also find, under the Catalogue of the doctor’s works in the Bibliotheca Bodleiana,-much about this time, another publication, somewhat analogous, and relating to this affair, viz. “An enquiry into the authority of the primitive Complutensian edition of the New Testament, in a letter to archdeacon Bentley,” 1722, 8vo. As to these proposals, Dr. Middleton takes upon him to say, that they were only published with a view “that some noise should be made in the world in his favour, to support his declining character by something great and popular, to recover esteem and applause to himself, and throw an odium and contempt upon his prosecutors, &c.” In 1725, at a public commencement on the 6th of July, the doctor made an elegant Latin speech, on creating seven doctors of divinity, in which, at the several periods, by little notes below, is set forth the whole form of the creation of a doctor of divinity. This piece is usually joined to his edition of Terence and Phsedrus: at least it is added to the Amsterdam edition of them in 1727, a very neat edition, corrected for the press by the doctor. To these notes on Terence, he has also added those of the learned Gabriel Faernius, and taken great pains in amending and correcting the author, not only from those ancient manuscripts which Gabriel Faernius had procured, but also from whatever manuscripts the royal library, those of Cambridge, or any of his friends, could afford; some of which, he assures us, were of great antiquity, and at least next, and very little inferior, to those of Faernius, the orthography of which, as the most ancient manuscript, he altogether follows. He has likewise altered the text in abundance of places, and assigns in the notes the reason for such alteration. Then follows the Schediasma of the metre and accents of Terence, by which the doctor proves that Terence is written all in Verse. This, however’, was a matter of some controversy betw-een the learned bishop Hare and our author; and during the | warmth of the debate. Will. Whiston remarked how intolerable it was, that while Grotius, Newton, and Locke, all laymen, were employing their talents on sacred studies, such clergymen as Dr. Bentley and bishop Hare were fighting about a play-book. About 1732, the doctor published his Milton’s “Paradise Lost,” when he was, as he says in his preface, about seventy years old. This is a very elegant and beautiful edition of that poem, but cannot be said to have contributed much to the editor’s deputation. 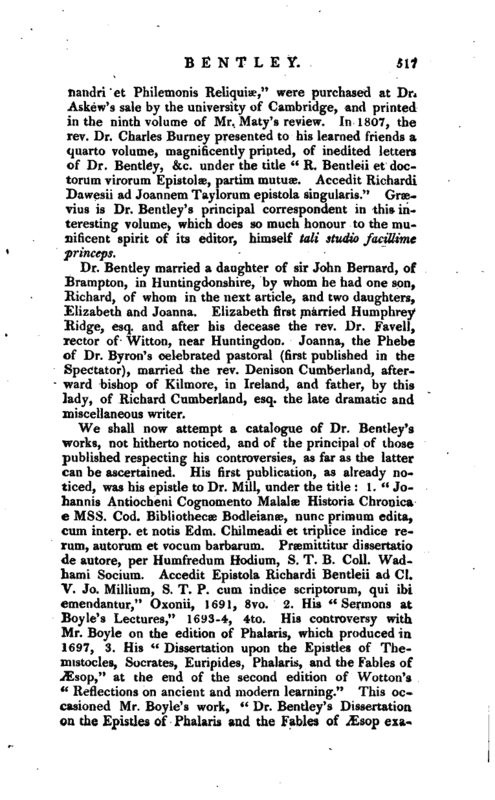 Dr. Bentley tells us, that he had prepared a new edition of the poet Manillas for the press, which he would have published, had not the clearness of paper, and the want of good types, and some other occasions, hindered him. He had also some design of publishing an edition of Hesychius, as we find by Mr. Graevius’s letter to him, and assured Dr. Mill, he could, if he pleased, correct five thousand faults in that author. His emendations on the Tusculan Questions of Cicero are adjoined to Mr. Davis’s edition of that author. From this produce of his studious, we must now pass to that of his more active, life, in the memorable complaints of rrial -administration urged against him by the college, which were the occasion of a long suit, whether the Crown‘ or the bishop of Ely was general visitor. A party in the college, displeased at some of his regulations, began to talk of the fortieth statute, de Magistri (si res exigat) Amotionc, and meditated a complaint to the bishop of Ely. The master hearing this, went to bishop Patrick, then at Ely, who told him, he had never heard before, that, as bishop of Ely, he had any thing to do in the royal college of Trinity; called his secretary to him, and bid him seek if there was any precedent for it in the bishop’s archives; but not one was found, nor so much as a copy of Trinity college statutes. Upon that, the doctor lent him one; and during that bishop’s time the matter was dropped. But in his successor Dr. Moore’s time, the party were encouraged to apply to the bishop, in 1709, and avast number of articles about dilapidations, but not one of immorality, bribery, or fraud, were exhibited against the master. These were, however, the subject of many pamphlets on both sides. 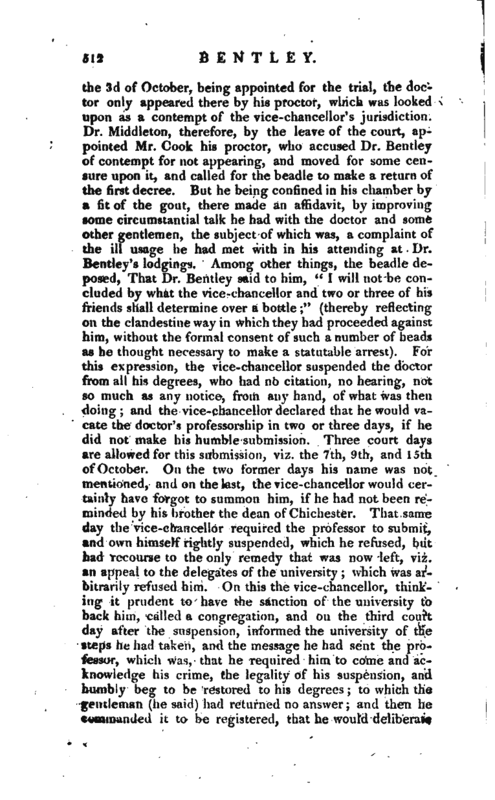 His lordship received the charge, intending to proceed upon it, which he conceived himself sufficiently authorised to do, and required Dr. Bentley’ s answer, which he declined for some time to give, pleading want of form in the charge; because other members of the college, | besides the seniors, had joined in the accusation, and the seniors themselves, as he alleged, had never yet admonished him; from whence he inferred, that all proceedings on such a charge, and whatsoever should follow on the same foot, would be ipso facto null and void. 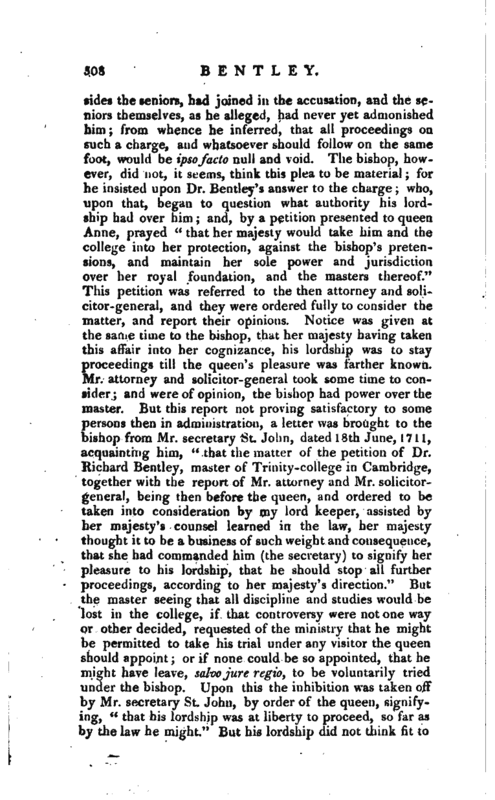 The bishop, however, did not, it seems, think this plea to be material; for he insisted upon Dr. Bentley’s answer to the charge; who, upon that, began to question what authority his lordship had over him; and, by a petition presented to queen Anne, prayed “that her majesty would take him and the college into her protection, against the bishop’s pretensions, and maintain her sole power and jurisdiction over her royal foundation, and the masters thereof.” This petition was referred to the then attorney and solicitor-general, and they were ordered fully to consider the matter, and report their opinions. Notice was given at the same time to the bishop, that her majesty having taken this affair into her cognizance, his lordship was to stay proceedings till the queen’s pleasure was farther known. Mr. attorney and solicitor-general took some time to consider; and were of opinion, the bishop had power over the master. But this report not proving satisfactory to some persons then in administration, a letter was brought to the bishop from Mr. secretary St. John, dated 18th June, 1711, acquainting him, “that the matter of the petition of Dr. Richard Bentley, master of Trinity-college in Cambridge, together with the report of Mr. attorney and Mr. solicitorgeneral, being then before the queen, and ordered to be taken into consideration by my lord keeper, assisted by her majesty’s counsel learned in the law, her majesty thought it to be a business of such weight and consequence, that she had commanded him (the secretary) to signify her pleasure to his lordship, that he should stop all further proceedings, according to her majesty’s direction.” But the master seeing that all discipline and studies would be lost in the college, if that controversy were not one way or other decided, requested of the ministry that he might be permitted to take his trial under any visitor the queen should appoint; or if none could be so appointed, that he might have leave, salvo jure regio, to be voluntarily tried under the bishop. Upon this the inhibition was taken off by Mr. secretary St. John, by order of the queen, signifying, “that his lordship was at liberty to proceed, so far as by the law he might.” But his lordship did not think fit to | proceed, till he was served uith a rule of court from the king’s-bench, in Easter-term 1714, to shew cause why a writ of mandamus should not issue out against him. The bishop, being then at Ely, was applied to by joint messengers on both sides, to go to the college, where he might have ended the matter in two days. But this was not thought so proper, and Ely-house at London was pitched on, where, instead of two days, the trial lasted at least six weeks, and the college paid a thousand pounds for it; three learned lawyers, who could know but very little of the matter, being admitted on each side, to make eloquent harangues, answers, and replies, upon questions arisingfrom above fifty articles, in which there was scarcely any thing material that might not easily be determined upon a bare inspection of the college statutes, registers, and books of accounts. 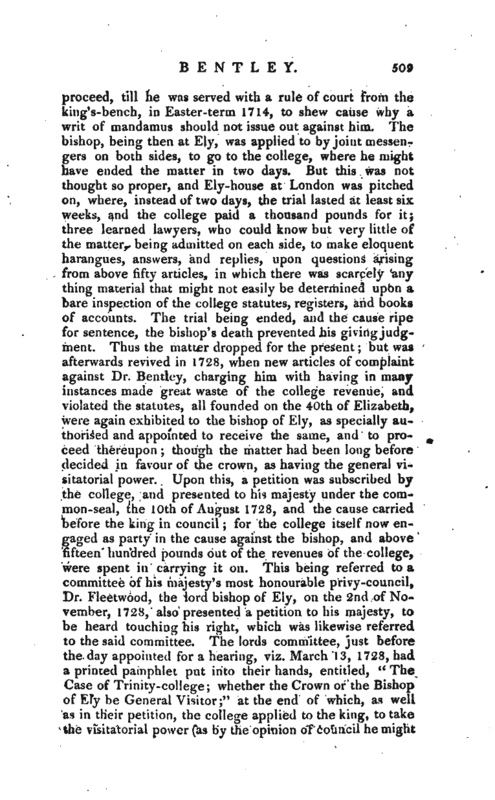 The trial being ended, and the cause ripe for sentence, the bishop’s death prevented his giving judgment. 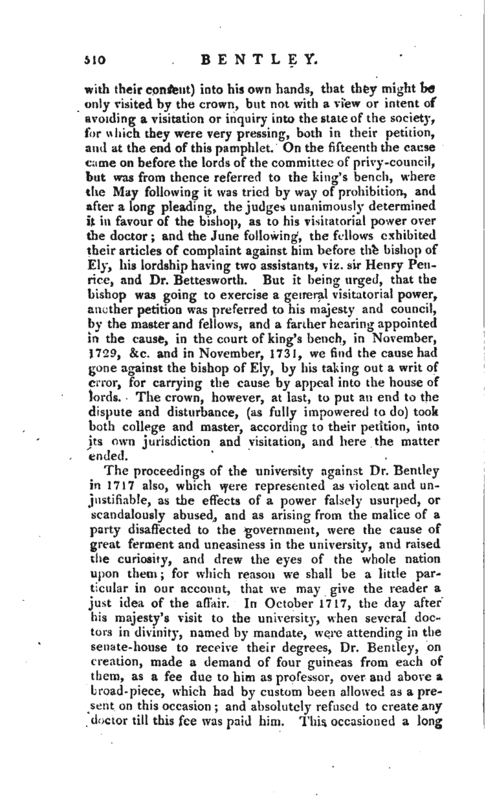 Thus the matter dropped for the present; but was afterwards revived in 1728, when new articles of complaint against Dr. Bentley, charging him with having in many instances made great waste of the college revenue, and violated the statutes, all founded on the 40th of Elizabeth, were again exhibited to the bishop of Ely, as specially authorised and appointed to receive the same, and to proceed thereupon; though the matter had been long before decided in favour of the crown, as having the general visitatorial power. Upon this, a petition was subscribed by the college, and presented to his majesty under the common-seal, the 10th of August 1728, and the cause carried before the king in council for the college itself now engaged as party in the cause against the bishop, and above fifteen hundred pounds out of the revenues of the college, were spent in carrying it on. This being referred to a committee of his majesty’s most honourable privy-council, Dr. Fleetwood, the lord bishop of Ely, on the 2nd of November, 1728, also presented a petition to his majesty, to be heard touching his right, which was likewise referred to the said committee. The lords committee, just before the clay appointed for a hearing, viz. March 13, 1728, had a printed pamphlet put into their hands, entitled, “The Case of Trinity-college; whether the Crown or the Bishop of Ely be General Visitor;” at the end of which, as well as in their petition, the college applied to the king, to take the visitatorial power (as by the opinion of council he might | with their consent) into his own hands, that they might b0 only visited by the crown, but not with a view or intent of avoiding a visitation or inquiry into the state of the society, for which they were very pressing, both in their petition, and at the end of this pamphlet. 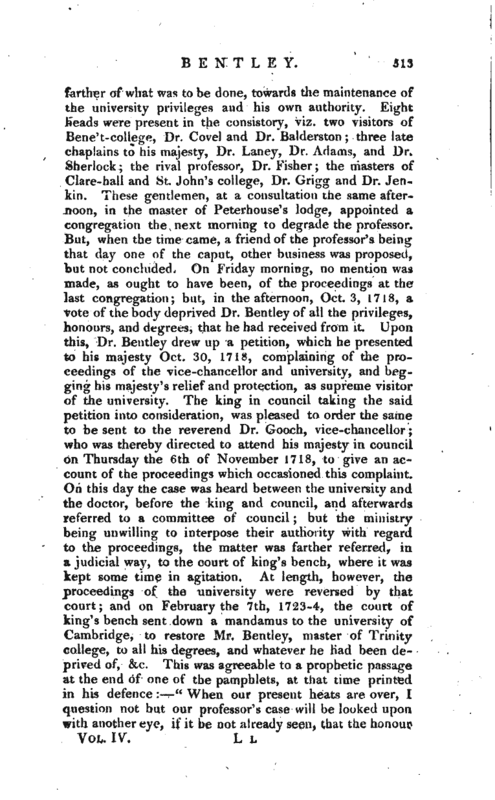 On the fifteenth the cause came on before the lords of the committee of privy-council, but was from thence referred to the king’s bench, where the May following it was tried by way of prohibition, and after a long pleading, the judges unanimously determined it in favour of the bishop, as to his visitatorial power over the doctor; and the June following, the fellows exhibited their articles of complaint against him before the bishop of Ely, his lordship having two assistants, viz. sir Henry Penrice, and Dr. Bettesworth. But it being urged, that the bishop was going to exercise a general visitatorial power, another petition was preferred to his majesty and council, by the master and fellows, and a farther hearing appointed in the cause, in the court of king’s bench, in November, 1729, &c. and in November, 1731, we find the cause had gone against the bishop of Ely, by his taking out a writ of error, for carrying the‘ cause by appeal into the house of lords. The crown, however, at last, to put an end to the dispute and disturbance, (as fully impowered to do) took both college and master, according to their petition, into its own jurisdiction and visitation, and here the matter ended. After this victory his time appears to have been chiefly employed on the literary undertakings of which we have given some account, until his death, July 14, 1742. He was buried in Trinity college chapel. 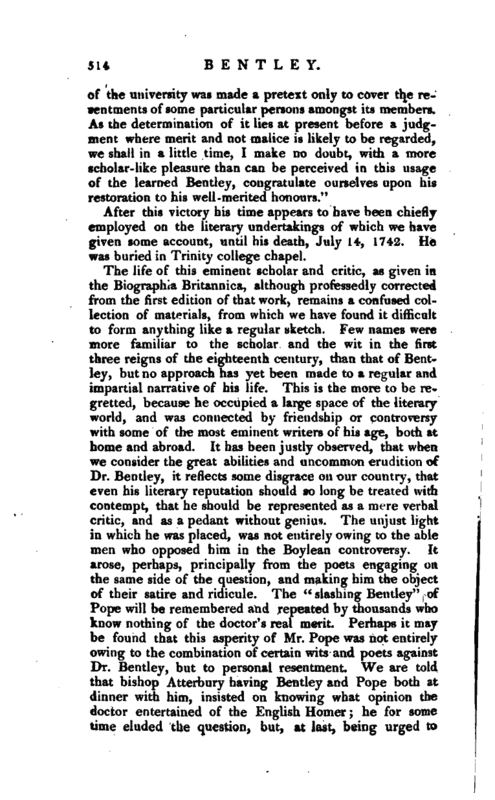 Amidst all the opposition, however, raised against Dr. Bentley, by the wantonness of wit, or the spleen of controversy, it may not be difficult to form a correct opinion of his general character from his critical and controversial writings. His extensive learning is universally acknowledged, yet the stern and unaccommodating manners of the pedant are not less obvious. His critical powers were perhaps equal, if not superior, to any man of his time, and would have been the object of unmixed admiration, had he exerted them with less rashness, and with less of that conceit which sometimes made him value a happy yet merely probable conjecture, as if it had been a decision founded on incontrovertible proof. Although he possessed what his enemies have not denied him, a peculiarly acute and comprehensive mind, he too often consulted his imagination, and was seduced by that to enlarge the fair boundaries of critical conjecture beyond all reasonable measure. Of his works, now to be found in libraries, one may surely be esteemed a valuable proof of his talents and judgment; his edition of Horace: and the loss of his Greek Testament, by whatever means that work was interrupted, may be considered as depriving the author of what would probably have handed down his name to posterity with the highest honours due to critical acumen and accuracy. Besides the estimate we form of him as a scholar, Bentley may be viewed in two lights, as a public and a private character. On the former, it must be confessed that his disputes with the university have thrown a dark shade; and in both it may be said, that no man could have created so many enemies, without some just provocation. 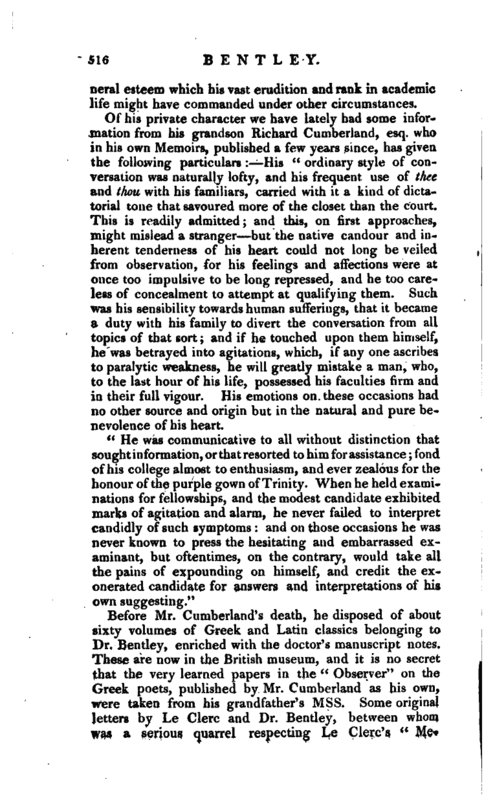 Whether this consisted only in a certain haughty and repulsive address, or coarseness of manners, and in a want of those amiable qualities which dignify social life and official station; or whether the accusations brought against him were of sufficient importance to justify the treatment he met with, independent of all personal considerations, may perhaps be ascertained by a close examination of the evidence (yet accessible) which was produced on this controversy. The restoration to his honours and privileges by a court of law, was undoubtedly a triumph, as far as those honours and privileges were valuable to him; but we do not find that he was restored to, or indeed ever possessed^ that | general esteem which his vast erudition and rank in academic life might have commanded under other circumstances. 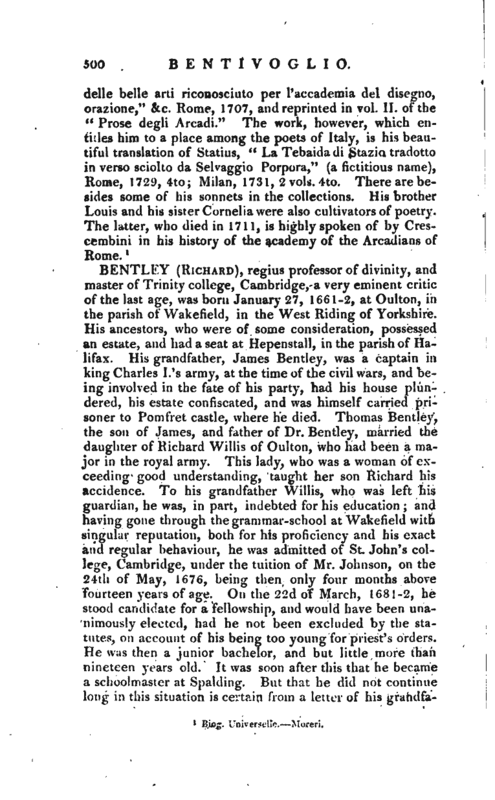 Of his private character we have lately had some information from his grandson Richard Cumberland, esq. who in his own Memoirs, published a few years since, has given the following particulars: His " ordinary style of conversation was naturally lofty, and his frequent use of thee and thou with his familiars, carried with it a kind of dictatorial tone that savoured more of the closet than the court. This is readily admitted; and this, on first approaches, might mislead a stranger but the native candour and inherent tenderness of his heart could not long be veiled from observation, for his feelings and affections were at once too impulsive to be long repressed, and he too careless of concealment to attempt at qualifying them. Such was his sensibility towards human sufferings, that it became a duty with his family to divert the conversation from all topics of that sort; and if he touched upon them himself, he was betrayed into agitations, which, if any one ascribes to paralytic weakness, he will greatly mistake a man, who, to the last hour of his life, possessed his faculties firm and in their full vigour. His emotions on these occasions had no other source and origin but in the natural and pure benevolence of his heart. 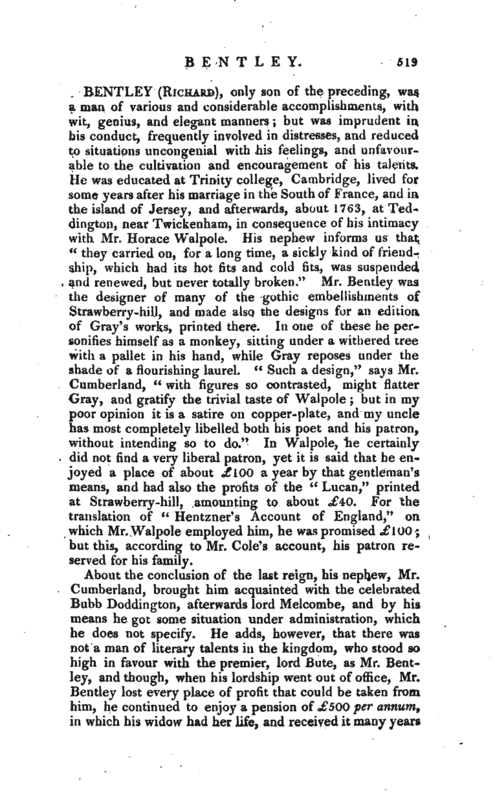 Dr. Bentley married a daughter of sir John Bernard, of Branapton, in Huntingdonshire, by whom he had one son, Richard, of whom in the next article, and two daughters, Elizabeth and Joanna. Elizabeth first married Humphrey Ridge, esq. and after his decease the rev. Dr, Favell, rector of Witton, near Huntingdon. Joanna, the Phebe of Dr. Byron’s celebrated pastoral (first published in the Spectator), married the rev. Denison Cumberland, afterward bishop of Kilmore, in Ireland, and father, by this lady, of Richard Cumberland, esq. the late dramatic and miscellaneous writer. Biog. Brit. Dodsley’s Poems, vol. VI. whore is the only specimen of Bentley’s poetry. Stillingfleet’s Life, 8vo. p. 149. Bp. Newton’s Life, 8vo. p. 9, 18,c. Cumberland’s Life, 4to. Bowles’s edition of Pope’s Works. —Gent. Mag. see Index, and vol. LXXI. Nichols’s Literary Anecdotes, vol. III. Whiston’s Life, Aland’s Deistical Writers, &c. &c.